Premium Compatible Label Tapes for the Dymo LABELPOINT 350 printer. The Dymo Labelpoint 350 is a thermal label printer that delivers high quality outputs. This label printer has low running costs as it uses Dymo Labelpoint 350 Label Tapes instead of toner or ink cartridges. 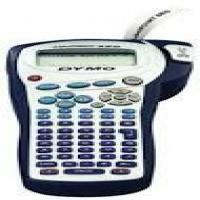 The Dymo Labelpoint 350 offers hundreds of options for customization but lacks rechargeable batteries. This label printer features an LCD display and an ABCD keypad. The LCD display is single-line. This label printer lacks an automatic cutter and has a manual cutter only. This label printer has a tape cassette compartment that can handle label tapes of different sizes such as 6mm, 9mm, 12mm & 19mm. For the ease of use, the Dymo Labelpoint 350 features navigation buttons present on the machine itself. This label printer can produce over 300 characters, 7 fonts, a large number of styles and effects and 99 print characters. This label printer has an in-built memory and is capable of printing barcodes as well. This printer can be easily connected through a USB cable. This label printer will automatically shut itself after 2 minutes when not in use. The Dymo Labelpoint 350 works on thermal transfer technology and uses Dymo Labelpoint 350 Label Tapes that have low running costs. This label printer offers a wide range of styling and effects and countless labeling options. It also has an in-built memory and auto shut-off feature present. But this label printer lacks an AC adapter and used rechargeable batteries. Q. The fixed-length label is selected and the length necessary to print the label exceeds the selected length. What should I do now? Q. How many font options are available in Labelpoint 350? A. There are seven font sizes available for printing out labels. When you select a particular font, that font applies to all characters on a label, until you insert format breaks if you want to use more than one font. Q. I need a good label tape which does not leave any sticky behind when peeled off. Will the Dymo Labelpoint 350 Label Tapes solve this purpose? A. Yes, these label tapes are designed to come off smoothly and does not create any mess behind when peeled off. Q. Can I serialize my labels? If yes, then how can I manage this? A. You can print the series of labels with the last number incremented by one. The number of labels serialized depend upon the number of copies you have selected to print. Only the last series of the number that follows any letter, space, or punctuation will get serialized. For example, abc123 will print as abc123, abc124, abc125 and the 123-998 will print as 123-998, 123-999, 123-1000, and so on. Q. Why is the Labelpoint 350 a popular choice among users? A. The LP350 is the DYMO's most dynamic printer, that features in the portable printer in its class designed specifically for professionals who need both speed and quality. This printer is ideal for efficiently labeling shelves, cabinets, inventory, tools, equipment, signage and more. This label printer has a tape cassette compartment that can handle Dymo Labelpoint 350 Label Tapes of different sizes such as 6mm, 9mm, 12mm, and 19mm. The LP350 is capable of barcode printing and offers an ABC colour coded keyboard with oversized keys for added convenience. Q. How can I add symbols while printing out the labels? When you locate the desired symbol, press OK to add that symbol to your label text. Q. Does Dymo Labelpoint 350 Label Tapes are available in both, genuine and compatible versions? A. Yes, these labelers are available in both versions, but we at Printerinkcartridges.ie supply the premium quality compatible Dymo Labelpoint 350 Label Tapes for the Dymo Labelpoint 350 printer. These are cost-effective in nature and provide the desired quality of labels same as the originals. Q. Which of the label tapes are suitable for replacement of Dymo Labelpoint 350 Label Tapes? Q. Can I get same day delivery for Dymo Labelpoint 350 Label Tapes in case I need them on urgent basis? A. Most of the products are dispatched on the same day but it may take 1-2 business days in delivering your product. Call us at 048 30833221 to check stock if your order is urgent.